In astronomy, corona is used to refer to the outer most area of the sun. In layman’s terms the corona is the proper name for the sun’s atmosphere. While significantly different from planetary atmospheres that refer to the air or gases that surround the planet due to gravity, the sun’s corona is generally held to be made out of plasma instead of regular gases. The corona is visible to the naked eye during solar eclipse. The halo of light that is visible around the moon during an eclipse is the corona. The corona is also the subject of scientific mystery since the corona is observed to be actually several times hotter than the surface of the sun. This observation has lead to divergent theories to explain this unusual difference in temperature. The corona is also known to form arches of plasma known as coronal loops. 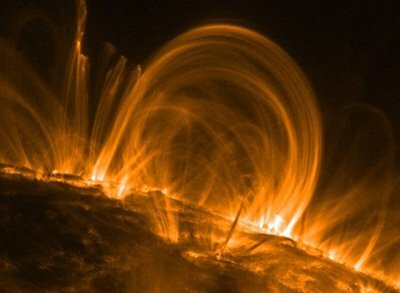 This is due to the reaction of the ionized gases to the suns magnetic field. The corona sometimes ejects a portion of itself from the sun causing coronal material to shoot away from the sun in very high speed. Such phenomenon is called a coronal mass ejection. Another unique thing about the corona is that it doesn’t always cover all the sun, periodically the “poles” of the sun is not covered by the corona.